For other people named Gary Locke, see Gary Locke (disambiguation). Gary Faye Locke (born January 21, 1950) is an American politician. Locke was the United States ambassador to China from 2011 until 2014. 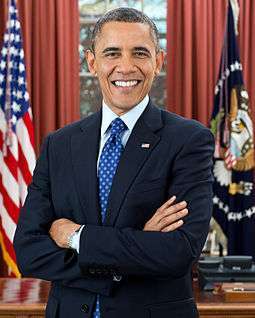 He was the 21st Governor of Washington from 1997 to 2005 and served in the Obama administration as United States Secretary of Commerce from 2009 to 2011. Locke is the first governor in the continental United States of Asian descent, and is the only Chinese American ever to serve as a governor of any state. He is also the first Chinese American to serve as the U.S. ambassador to China. Gary Locke was born on January 21, 1950, in Seattle, Washington, and spent his early years living in the Yesler Terrace public housing project. A third-generation Chinese American with paternal ancestry from Taishan, China, Locke is the second of five children of James Locke, who served as a staff sergeant in the U.S. Fifth Armored Division during World War II, and his wife Julie, who is from Hong Kong. His paternal grandfather left China in the 1890s and moved to the United States, where he worked as a houseboy in Olympia, Washington, in exchange for English lessons. Gary Locke did not learn how to speak English until he was five years old and entered kindergarten. Locke graduated with honors from Seattle’s Franklin High School in 1968. He achieved Eagle Scout rank and received the Distinguished Eagle Scout Award from the Boy Scouts of America. Through a combination of part-time jobs, financial aid, and scholarships, Locke attended Yale University, graduating with a Bachelor of Arts in political science in 1972. He later received his juris doctor from Boston University School of Law in 1975. In 1982, Locke was elected to Washington state's South Seattle district in the Washington House of Representatives, where he served as the chair of the Appropriations Committee. Eleven years later, in 1993, Locke was elected as King County's executive, defeating incumbent Tim Hill. 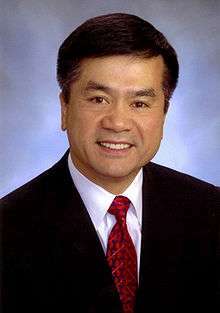 In 1996, Locke won the Democratic primary and general election for governor of Washington, becoming the first Chinese American governor in United States history. His political committee was fined $2,500 by regulators in 1997 after admitting to state campaign finance law violations during his successful campaign. Locke faced criticism from fellow Democrats for embracing the Republican Party's "no-new-taxes" approach to dealing with Washington's budget woes during and after the 2001 economic turmoil. Among his spending-reduction proposals were laying off thousands of state employees; reducing health coverage; freezing most state employees' pay; and cutting funding for nursing homes and programs for the developmentally disabled. In his final budget, Locke suspended two voter-passed school initiatives and cut state education funding. Supported by the state's political left, former Washington Supreme Court Justice Phil Talmadge announced his plans to challenge Locke in the 2004 Democratic primary, but Talmadge ended his campaign early for health reasons; Locke won re-election in 2000. On the national stage, Democrats saw Gary Locke as a possible vice-presidential choice. In 1997, Locke was a guest at that year's State of the Union address. Locke was chosen to give his party's response to George W. Bush's 2003 State of the Union Address. In a surprise move, Locke announced in July 2003 that he would not seek a third term, saying, "Despite my deep love of our state, I want to devote more time to my family." Susan Paynter, a columnist at the Seattle Post-Intelligencer, suggested that racist slurs, insults, and threats that Locke and his family received, especially a large number which came after his rebuttal to George W. Bush's 2003 State of the Union address, may have played a role in Locke's decision to leave office after two terms. The governor's office received hundreds of threatening letters and e-mails; others threatened to kill his children. His official portrait, painted by Michele Rushworth, was unveiled in the state capitol by Governor Christine Gregoire on January 4, 2006. After leaving office, Locke joined the Seattle office of international law firm Davis Wright Tremaine LLP, in their China and governmental-relations practice groups. During the leadup to the 2008 Democratic presidential primary, Governor Locke signed on as Washington co-chairman of Democratic candidate Hillary Clinton's bid for President. On December 4, 2008, the Associated Press reported that Locke was a potential candidate for Secretary of the Interior in then-President-elect Barack Obama's cabinet. Eventually, then-Colorado Senator, Ken Salazar, was nominated for that position instead. On February 25, 2009, Locke was announced as President Barack Obama's choice for Secretary of Commerce, and his nomination was confirmed by the United States Senate by unanimous consent on March 24, 2009. Locke was sworn in March 26, 2009, by District Judge Richard A. Jones, and he was sworn in by President Obama on May 1, 2009. 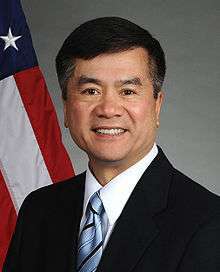 Locke was the first Chinese American appointed as Secretary of Commerce, and one of three Asian Americans in Obama's cabinet, joining Secretary of Energy Steven Chu and Secretary of Veterans Affairs Eric Shinseki. Politico reported Locke had been a popular cabinet member among both businesses and the executive branch. A declaration of assets made in March 2011 showed Locke to be the sixth-richest official in the U.S. executive branch. Following the resignation of Jon Huntsman, Jr., Locke was nominated by President Obama to serve as U.S. ambassador to China. The Senate confirmed Locke unanimously on July 27, 2011; Locke resigned as Secretary of Commerce on August 1, 2011. A photo of Locke carrying his own backpack and ordering his own coffee at the Seattle-Tacoma International Airport went viral in China on the Sina Weibo social network, with many commentators approving of his humble low-key style. At his first news conference after arrival in Beijing, Locke pledged to promote bilateral cooperation and understanding between the two countries. Early in Locke's ambassadorship, Chinese dissident Chen Guangcheng escaped from house arrest and sought refuge in the U.S. Embassy in Beijing in April 2012. On May 2, China's Ministry of Foreign Affairs demanded an apology from the U.S. for its role in the incident. In an editorial on May 4, Beijing Daily questioned Locke's motives by taking in Chen and described Chen as "a tool and a pawn for American politicians to blacken China". In late November 2013, Locke announced that he would step down as ambassador to spend more time with his family in Seattle. In an analysis of his ambassadorship, Sun Zhe, a professor at Tsinghua University in Beijing, said, "It is not an easy job to be the American ambassador to China. Gary Locke is not a shining star, but a simple and unadorned ambassador." Shen Dingli, dean of the international studies department at Fudan University in Shanghai, largely concurred, commenting that Locke "showed us how a U.S. minister-level official behaves by taking economy-class flights" but "caused a twist" when he allowed Chen refuge in the U.S. embassy. Max Baucus, a former United States Senator from Montana, was President Obama's nominee to replace Locke and was confirmed by the Senate 96–0; Vice President Joe Biden administered the oath of office on February 21, 2014. On Feb 17, 2016, Locke joined the board of the now Chinese-owned AMC Theatres. On May 31, 2016, Locke joined the board of the Seattle-based global health nonprofit PATH. Locke married his wife, Mona Lee, a television reporter for the NBC affiliate KING 5 television in Seattle and former Miss Asian America, on October 15, 1994. 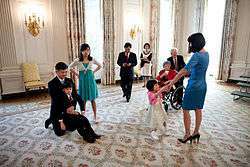 Her parents immigrated to the United States from Taiwan, while they were originally from Mainland China, her paternal side from Shanghai and maternal side from Hubei. The Lockes have three children: Emily Nicole (b. March 1997), Dylan James (b. March 1999), and Madeline Lee (b. November 2004). Regarding his ethnicity and being the only person of Chinese descent to have served as an ambassador to China, he said, "I’m proud of my Chinese heritage. I’m proud of the great contributions that China has made to world civilization over thousands of years. But I’m thoroughly American. I’m proud of the great values that America has brought to the entire world and all that America stands for." ↑ Gilbert Cruz (February 25, 2009). "Commerce Secretary: Gary Locke". Time. Retrieved March 25, 2009. 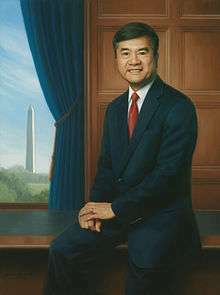 ↑ "Commerce Secretary Gary Locke on Asian-American and Pacific Islander Month 2010". Commerce News. April 30, 2010. Retrieved September 10, 2012. 1 2 "Remarks by President Obama and Commerce Secretary Nominee Gary Locke". Whitehouse.gov. February 25, 2009. Retrieved July 12, 2009. ↑ Frank Chesley (June 29, 2006). "Locke, Gary Faye (b. 1950)". HistoryLink. Retrieved March 25, 2009. ↑ "Biography of Governor Gary Locke". Who's Who of Asian Americans. Retrieved November 9, 2008. 1 2 Sidoti, Liz (February 25, 2009). "Obama selected Locke to run Commerce Department". Yahoo! News. Associated Press. Archived from the original on February 28, 2009. Retrieved February 25, 2009. ↑ Clinton, Bill (February 4, 1997). "Remarks By The President In State Of The Union Address". The White House. Retrieved February 24, 2009. Gary Locke, the newly elected Governor of Washington State, is the first Chinese American governor in the history of our country. He's the proud son of two of the millions of Asian American immigrants who have strengthened America with their hard work, family values and good citizenship. He represents the future we can all achieve. Thank you, Governor, for being here. Please stand up. ↑ "Democratic Leaders Announce Governor Gary Locke Will Deliver the Democratic Response to State of the Union Address" (Press release). Congresswoman Nancy Pelosi. January 15, 2003. Retrieved February 24, 2009. Senate Democratic Leader Tom Daschle and House Democratic Leader Nancy Pelosi announced today that Governor Gary Locke of Washington state will deliver the Democratic response to President Bush’s State of the Union address. 1 2 "Gov. Gary Locke Announces He Will Not Seek a Third Term" (Press release). Washington State Office of the Governor. July 21, 2003. Retrieved February 24, 2009. 1 2 Paynter, Susan (July 26, 2003). "Threats to Locke's family are a factor in third-term decision". Seattle Post-Intelligencer. Retrieved December 17, 2007. ↑ Ammons, David (October 7, 2007). "Ex-governor Locke named Clinton state co-chair". Seattle Post-Intelligencer. Retrieved October 17, 2007. ↑ "U.S. Senate Confirms Gary Locke as Commerce Secretary". 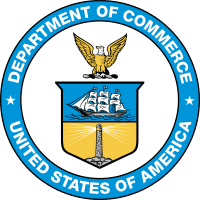 United States Department of Commerce. March 24, 2009. Retrieved March 25, 2009. ↑ O'Keefe, Ed (March 27, 2009). "Locke Officially Leading Commerce". The Washington Post. Retrieved March 29, 2009. ↑ "CEOs: Locke Obama's Secret Weapon". Politico. 1 2 Jiao, Priscilla (May 18, 2012). "Locke calls daily's bluff by declaring his assets". South China Morning Post. Retrieved April 12, 2015. ↑ Song, Kyung M. (March 9, 2011). "Obama officially nominates Locke as China envoy". The Seattle Times. Retrieved March 9, 2011. ↑ "U.S. Senate Periodical Press Gallery". Senate.gov. Retrieved May 22, 2012. ↑ Nagesh, Gautham (August 1, 2011). "Commerce Secretary Gary Locke resigns to become Ambassador to China". The Hill. Retrieved August 1, 2011. ↑ "Gary Locke charms China by carrying own bag". The Seattle Times. Associated Press. August 16, 2011. Retrieved September 11, 2016. ↑ "Gary Locke charms China by carrying own bag". The Seattle Times. Retrieved September 11, 2016. ↑ Patrick Mattimore (August 19, 2011). "Beijing welcomes you, Ambassador Locke". China Daily. Retrieved August 20, 2011. ↑ "New U.S. Ambassador Pledged to Promote Cooperation between U.S. and China". The China Times. Retrieved August 14, 2011. ↑ Chris Buckley (May 4, 2012). "China paper calls Chen a U.S. pawn; envoy is a "troublemaker"". MSNBC. Reuters. Retrieved May 4, 2012. ↑ Denyer, Simon (November 20, 2013). "U.S. Ambassador to China Gary Locke to step down, rejoin family in Seattle". Washington Post. Retrieved February 22, 2014. ↑ Herman, Malia Rulon (February 21, 2014). "Max Baucus sworn in as ambassador". Great Falls Tribune. Retrieved February 22, 2014. ↑ "Gary Locke and John Zeng Join AMC Entertainment Holdings, Inc. Board of Directors" (Press release). AMC Theatres. 2016-02-17. Retrieved 2016-08-08. ↑ "Announcement: PATH welcomes Governor Gary Locke to its board of directors - PATH". www.path.org. Retrieved 2016-10-19. ↑ "About Governor Gary Locke". 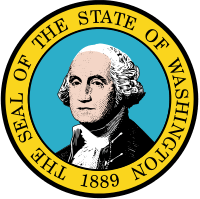 Digitalarchives.wa.gov. Retrieved May 22, 2012. ↑ Wan, William. "In parting speech, U.S. ambassador urges China to improve human rights record." The Washington Post. February 27, 2014. Wikimedia Commons has media related to Gary Locke. Gary Locke, "Trends and Challenges of China's Economic and Technology Rise," Keynote Address to China 2.0 Conference, Stanford Graduate School of Business, Oct. 24, 2013. —Video. "Gary Locke collected news and commentary". The New York Times.